The second edition of the Kargil International Film Festival 2017 was inaugurated by Haji Anayat Ali (Chairman - J&K Legislative Council) at Syed Mehdi Memorial Hall in Kargil, Ladakh. The Guest of Honour was Kacho Ahmad Ali Khan (CEC LAHDC, Kargil) and the special guest was Haji Asgar Ali Karbalai (MLA, Kargil). 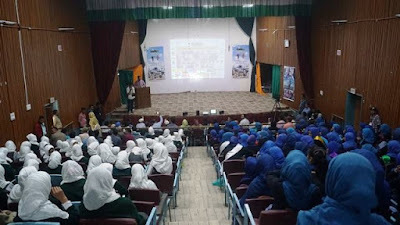 This Festival is organized by DBG Film Club in collaboration with Ladakh Autonomous Hill Development Council Kargil (LAHDC) & Students Educational Movement of Kargil (SEMOK) . The event started off with a teaser of the officially selected 85 films. Meraj Sidiqui, the Director of the festival spoke about the need to change the perception of Kargil from just being a war-zone and instead, showcase Kargil’s rich and vibrant cultural heritage to the world. Others who spoke on the occasion were Tom Joseph, Hassan Hundurmani, Nazia Batool & Mathew Joseph. Sajjad Kargili, the Festival Co-ordinator was appreciated by one and all for taking the efforts in making this event a huge success. The festival will continue till the 23rd of August, 2017.